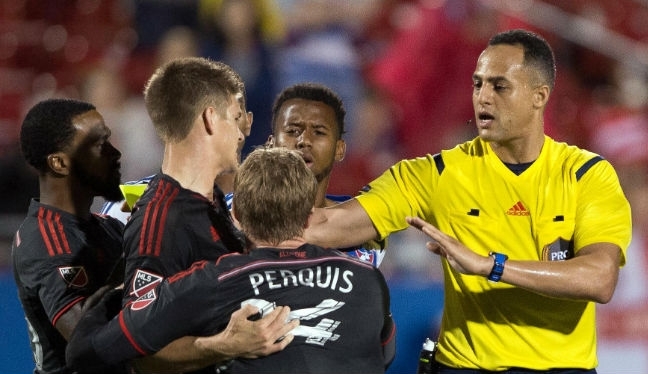 PRO’s Ismail Elfath says he was prepared for extreme weather at Toyota Stadium, after he refereed FC Dallas versus Toronto FC in a game that was delayed 206 minutes due to lightning and severe storm conditions. Elfath’s management skills were put to the test in Texas but the game successfully came to an end in the early hours of Sunday morning, with the hosts taking it 3-2. The referee insists he and his crew were ready for any scenario – something he learnt whilst coming up through the North American officiating ladder. “We had been monitoring the weather reports throughout the day and before the game so we knew it was heading our way,” Elfath reflected to proreferees.com. “We had made our preparations for the different scenarios, so we weren’t surprised by it. It happens often in Texas. They say if you don’t like the weather, wait an hour. “You always learn the hard way as a referee coming up through the ranks; whether it be if you don’t bring the right kit, the right cleats. It’s the same with the weather; you learn the hard way if you don’t prepare for it. “Being proactive puts everyone at ease. We had a meeting before the game with the team contacts and I described to them what the procedure would be for each scenario – when we’ll stop, what conditions would force us to stop, how long we’d stop for. “Me and the crew played with the ball a little bit in the locker room to stay sharp, and keep warm, and continuously kept the teams updated on field conditions, the next stoppage and when to anticipate warm-ups. Prior to the delay, the game in Frisco sprung to life straight from kickoff, with Fabian Castillo putting Dallas ahead after just 29 seconds. Like with the weather, Elfath and his crew were ready for an early goal, as they are always alert from the first whistle to the last. In this case, the center official’s concluding blow of the whistle was nearly five-and-a-half-hours after his first. “Having a goal that early in a game really tests our concentration and preparation, but the crew was ready for it and it was exciting to be a part of.